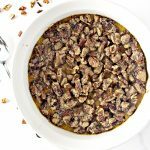 Cinnamon, nutmeg, and allspice take the taste up a notch in this Paleo Sweet Potato Casserole recipe, while the roasted pecans epitomize the holiday season. This delicious side dish also happens to be gluten-free, grain-free, dairy-free, and soy-free, too! 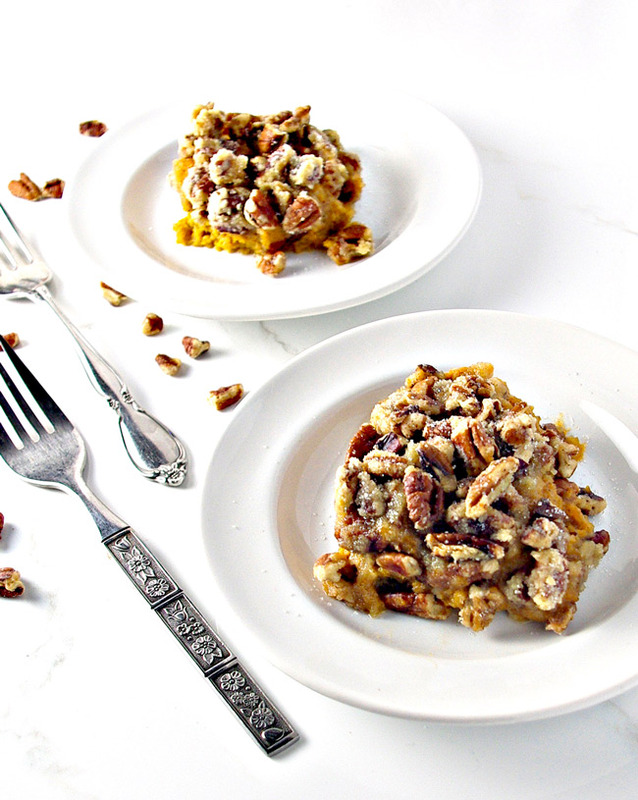 Paleo Sweet Potato Casserole is a family staple during the holidays. Twinkle, who was about four years old when I first made it, shouted, “Blech! It tastes so GOOD, Mama! !” Since she went back for seconds and then proceeded to ask for another batch the next day, I feel it is safe to say the recipe was a hit. K-Hubs declared it a new family tradition, while Toodle didn’t mind it when she took a bite. “Mom, it’s so…interesting.” Coming from our discerning first born, that is a stellar review, and I’m all too happy to take it. I don’t normally go nuts over sweet potatoes, but I love them here (I also love them in Maple Bacon Sweet Potatoes). So when I decided to embark on a paleo Thanksgiving side dish recipe, I knew it had to be one everyone could enjoy. Paleo Sweet Potato Casserole is that recipe. K-Hubs says it tastes like a cross between pumpkin pie and pecan pie. I don’t like pumpkin pie or pecan pie (Toodle and I are the “discerning” members of the family). But, I do like this recipe. In fact, I heart it in a big way. 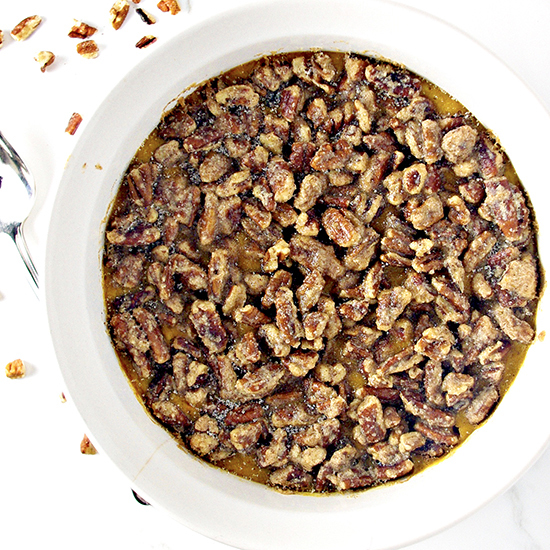 The roasted maple cinnamon pecan topping is reminiscent of the aroma of roasted nuts sold at the craft bazaars Mom, The Gram, and I used to frequent every fall when I was a child. Some people patron a favorite bar or two. The three of us patroned our favorite craft shows. Nothing says need-based purchase like a 1980s mauve and country blue floral arrangement (or fuchsia and teal if you happen to shop about a decade later). As for Paleo Sweet Potato Casserole, Twinkle and I spent a full five minutes just smelling it. No craft show roasted nuts needed. But if time travel were possible, this recipe would be the portal. I seriously go back about 25 years every time I take a bite. The smell is as intoxicating as the flavor is out of this world. 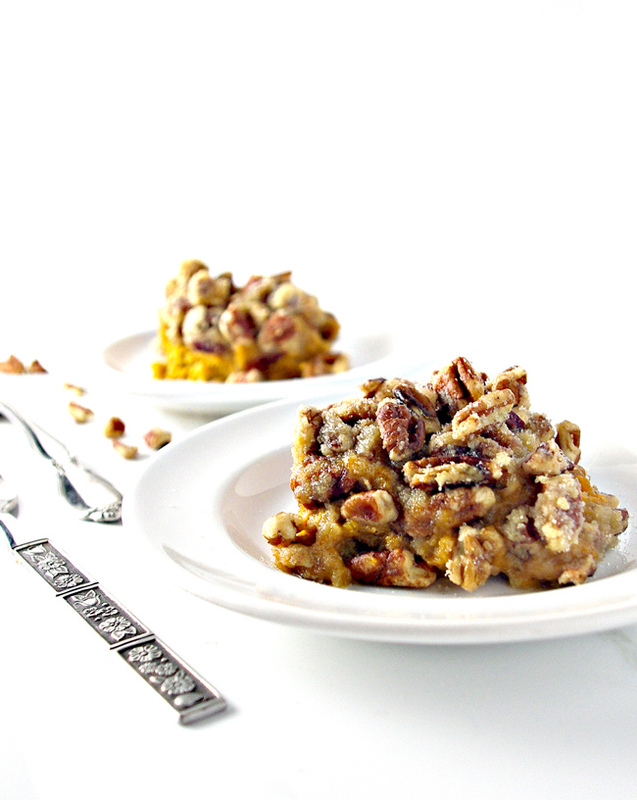 Paleo Sweet Potato Casserole is a filling, comforting paleo recipe. So how do you go about making it? As side dishes go, it’s quite easy to prepare. First, steam the chopped sweet potatoes and then, using an electric mixer, combine them with the almond milk, coconut oil, maple syrup, sea salt, spices, vanilla, and eggs in a large mixing bowl. Next, pour the mixture into a 11/2 quart ceramic baking dish. For the delectable maple cinnamon pecan topping, I rinse and reuse the mixing bowl, combining the pecans, coconut oil, maple syrup, cinnamon, and almond flour. Then I pour the mixture over the sweet potato filling and bake covered for 25 minutes, followed by another five minutes of uncovered baking. If the roasted pecan mixture comes out a little clumpy, stir it with a fork prior to pouring it on the filling so as to break up the almond flour clumps. 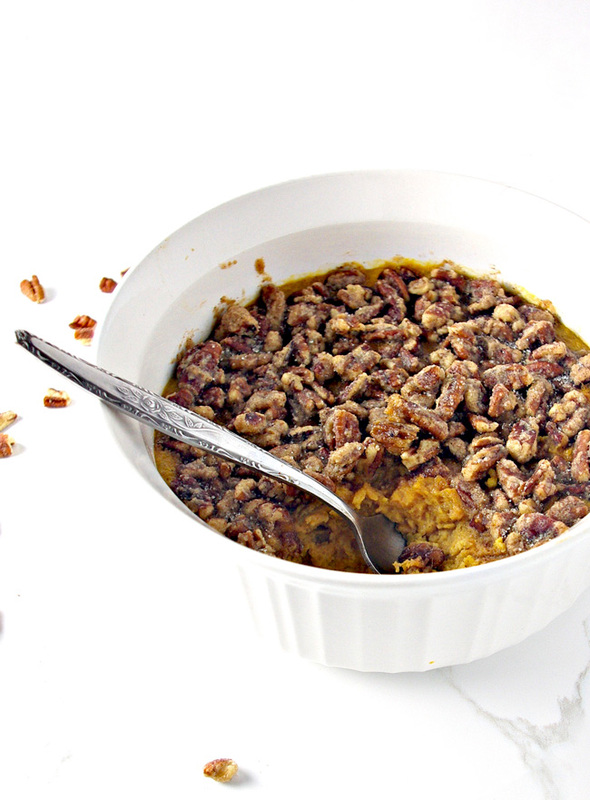 Alternatively, if you have a few leftover pecans, then you can throw them into the mix as that often does the trick. In those last five minutes of baking, keep an eye on the pecans. While you want them to roast, you don’t want them to burn. From there, serve and enjoy! It’s that easy to make. Paleo Sweet Potato Casserole is the perfect blend of creamy fillings and crunchy toppings, especially for the holidays but also if you can’t make it to a craft bazaar and miss the smell of the roasted nuts cart always placed in an easily-accessible corner of the building. Set oven to 350 degrees and place baking rack in the middle slot of the oven. Steam sweet potatoes until easily pierced with a fork. In a large mixing bowl, combine sweet potatoes, almond milk, 3 tablespoons melted coconut oil, 3 tablespoons maple syrup, vanilla, 1 teaspoon cinnamon, allspice, nutmeg, and sea salt. Using an electric mixer, blend on high speed until smooth. Add two eggs and blend until smooth. Pour into a 1 1/2 quart baking dish and set aside. Rinse bowl if reusing to prepare the pecan topping. 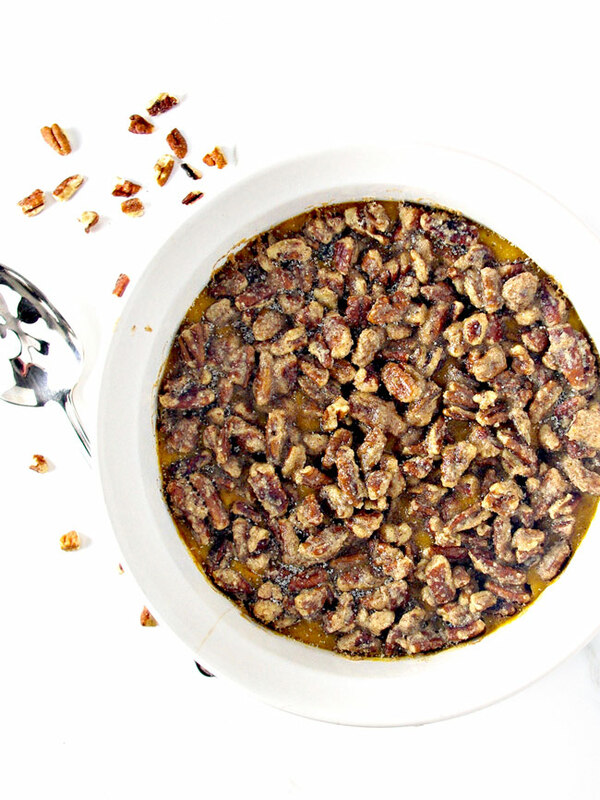 Combine pecans, 2 tablespoons melted coconut oil, 3 tablespoons maple syrup, and cinnamon. Stir with a spoon to evenly coat the pecans. Add in the almond flour and stir. Use a fork if the flour climbs together. Pour over the sweet potato casserole. Cover with foil and bake for 25 minutes. Remove foil and bake another 5 minutes. Keep an eye on the pecans during the last five minutes to prevent burning.